The first one on the list is Maryland with an income tax of 5.5% and a sales tax of 6%. The property tax per capita racks up to $1,171. The sales taxes for Maryland residents are on the rise. The income tax in 2010 raked in $6.2 billion and $3.8 billion in sales tax. The lawmakers of Maryland are thinking about increasing taxes on medicine, gasoline, online shopping and snacks. There will also be a proposed increase on the sales tax for alcohol, going from 6% to 9%. This increase is intended to add $84.8 million to Maryland’s revenue. The next state on the list is Massachusetts with an income tax of 5.3% and a sales tax of 6.25%. The property tax per capita comes in at $1,789. According to the Tax Foundation, Massachusetts residents have the highest amount of debt per person in the United States with $11,357 a person. There’s also a $2 billion increase in tax revenue because of the strengthening of the economy, so the tax rate will go from 5.3% to 5.25%. Next up is New York with an income tax of 7.85% and a sales tax of 4%. The property tax per capita is $2,009. There’s been a very controversial stock-transfer tax that’s been suggested; however, it’s most likely going to be given the red light. The state also has the highest cigarette tax, making a pack cost an average of $4.35. The state with the second highest tax rate is New Jersey, a close neighbor, with an income tax of 6.37% and a sales tax of 7%. The property tax per capita is $2,625. New Jersey is normally listed as one of the states with the highest tax burdens, and according to the Tax Foundation the state has the highest property tax per capita. New Jersey is also one of the 14 states to tax Social Security income. 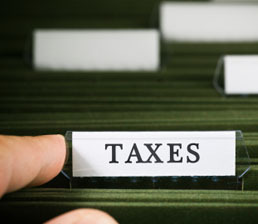 According to Bloomberg and MSN Money, the number one state with the highest tax burden is Connecticut with an income tax of 5% and a sales tax of 6.35%. The property tax per capita comes in at $2,381. In addition to having the highest tax rates, Connecticut also has the highest income per capita at $56,001 per person in 2010. In July 2012, there was a sales tax increase that raised the rate from 6% to 6.35%. In addition, the state also collects the third-highest property taxes per capita. It’s also one of only 14 states that taxes Social Security income. If you’re looking for a states to move to for a solid amount of time, you might want to take the states’ tax rates into consideration.